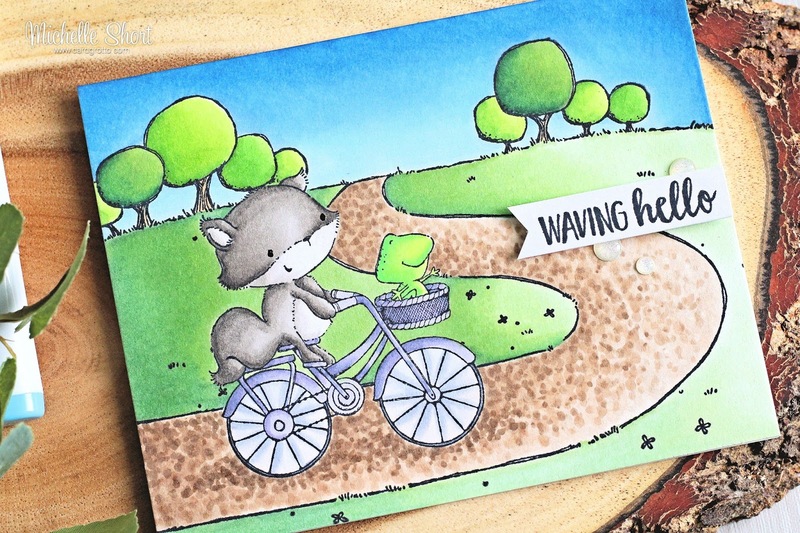 For my card, I started off by stamping Free Spirits (Fox and Frog on Bicycle) on to a white card panel. I stamped the image again on to masking paper, cut out and added this on top of the first image. I then stamped the Country Road Background on to the panel. I removed the mask and then coloured the image with Copic Markers. I first coloured the background using shades of green for the grass and trees and then shades of brown for the path. I tried to create some texture on it using dots. The fox, bicycle and frog were then coloured. I added black glaze pen to the fox's eyes. 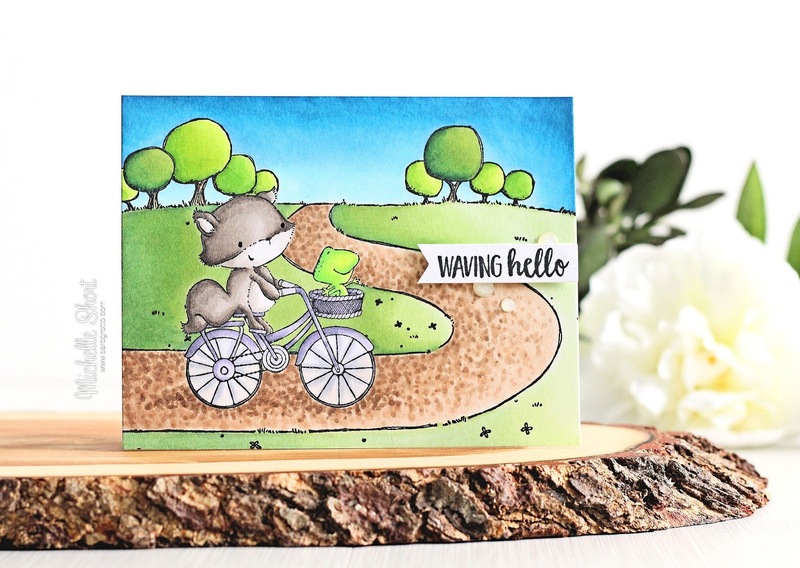 I took the 'waving hello' sentiment from the Journey Sentiments Set and stamped this on to a strip of white cardstock. I then created a ribbon end on one side. The image panel was added to a white A2 card base with ATG and then the sentiment banner was added with foam tape. To finish off, I added a few sparkly gumdrops around the sentiment banner. COPIC MARKERS - Grass: G46, G43, G40. Trees: G85, G82, YG17, YG23, YG03, YG01. Path: E44, E43, E42, E41, E40. Sky: B45, B41, B32, B21, B14, B12, B00, B000. Bike: V28, V25, V22, C3, C1, C0. Fox: W7, W6, W5, W3, W2, W2, W1, W0. Frog: YG07, YG05, YG01. That's right! 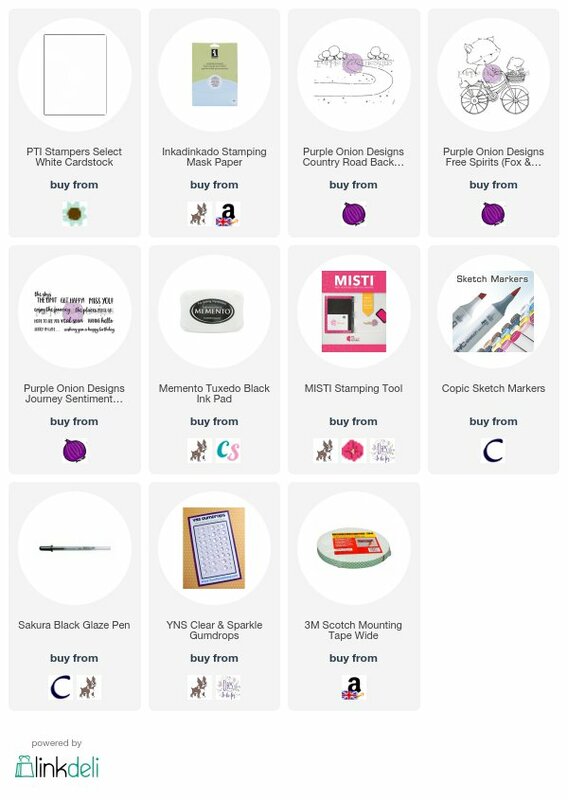 All stamps are currently 25% off so if you have been putting off making an order, now is the time to do it! 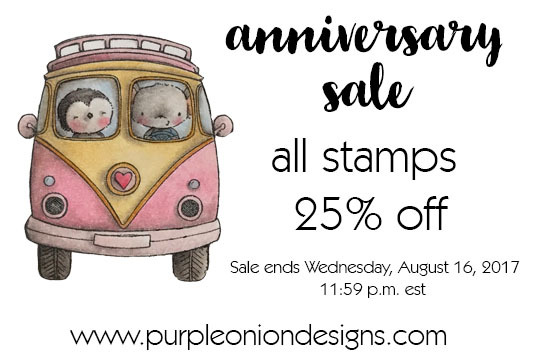 For more inspiration using these stamps, please head over to the Purple Onion Designs blog. Thanks so much for visiting me today. I hope you have a great day! So cute! The fox is adorable!